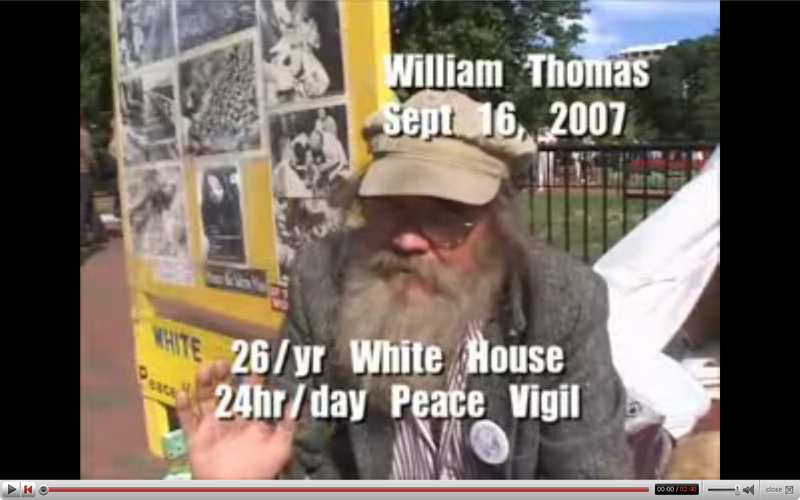 William "Doubting" Thomas's "Free Philosophical Forum" stood outside the White House 24 hours a day from June 3, 1981 until August 5, 2008. Thomas died on January 23, 2009. Thomas's faithful colleague, Concepcion Picciotto, continued to vigil in Lafayette Park with photos of Thomas and of victims of the Hiroshima and Nagasaki bombings, with the help of friends, until her death on January 25, 2016, ten days after her 80th birthday, 35 years into the vigil. Friends who helped Concepcion keep the vigil after Thomas died are continuing to do so, under the watchful eye of the Park Police. It's thanks to William Doubting Thomas's legal mind and absolute honor that the vigil became protected space, but it is the people who keep the vigil going who are its heart. Thank you, and may you always speak with wisdom, honesty, and compassion, as Thomas always did. A "William Thomas Memorial" facebook page has been set up for people who remember and admired Thomas and Connie to post photos and memories. "Thomas Farewell" - There was a celebration of Thomas' life and work on February 7, 2009. A lovely film was produced with messages of love and hope from many amazing friends and family, too many of whom are also gone. 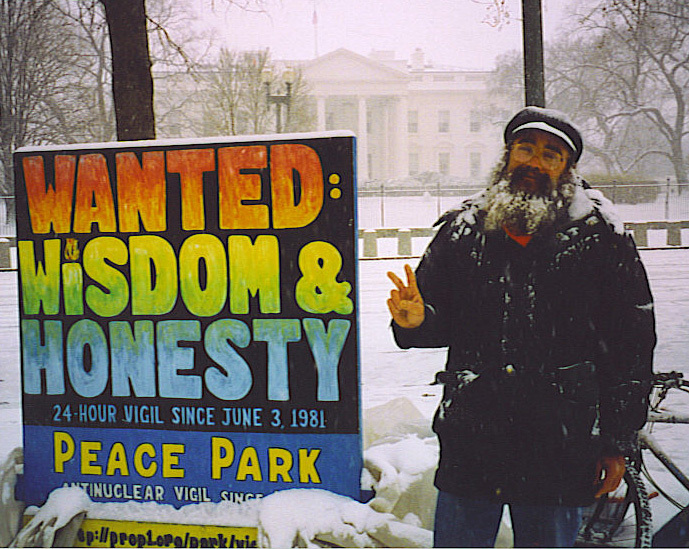 In 1999, Thomas produced "Proposition One: Peace Through Reason" about the whys and hows of the successful DC Voter Initiative 37 campaign and resulting bill in Congress calling for global abolition of nuclear weapons and conversion of the arms industries to provide for human needs such as health care, education, environmental restoration, and clean, renewable, non-nuclear energy. "The Ground War At Home" is about what happened to Thomas and other vigilers and drummers outside the White House during the 40 days and nights of the first Gulf War in 1991. This was broadcast on Public Access Television all over the country. After Thomas's death, and in his honor, Thomas' wife of 25 years, Ellen, launched the "Proposition One In 2010 Campaign," traveling with a crew of four (including Thomas's dog Sophia) around the country in 2009 and 2010 to connect with other activists who work for nuclear weapons abolition. On that tour they spoke about putting voter initiatives on the ballot if politicians aren't responsive to their constituents' requests to co-sponsor the "Nuclear Weapons Abolition and Economic and Energy Conversion Act." In 2016, Ellen is traveling again, this time with Carol Urner of Women's International League for Peace and Freedom, once again promoting Proposition One. Contact Ellen if you would like to learn more. Here are links to some of Thomas's writings. James McGinley did the graphics. 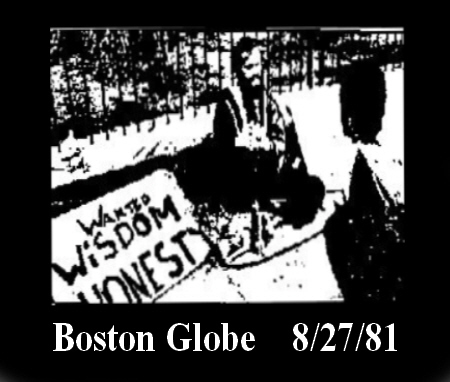 After Wandering in the Desert, on June 3, 1981, William Thomas sat down on the White House sidewalk with a small cardboard sign, "WANTED: WISDOM & HONESTY," and a flier. He was quickly arrested, the first of many attempts to displace him. He kept coming back; 25 Years Defending what's Constitutionally Right. Thomas' fast ended, but he remained to establish a fulltime, unpaid continuous forum in front of the White House. 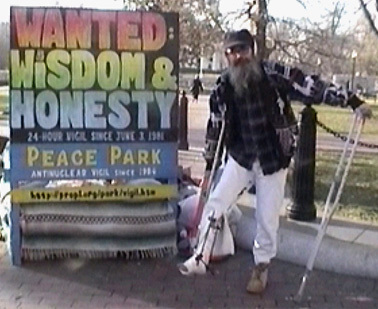 Thomas' message, "WANTED, WISDOM & HONESTY," has stood north of the White House day and night since 1981, except for a three-month period in 1988 when Thomas was sent to prison by U.S. Judges Flannery and Richey, who wanted to "deter others from adopting your lifestyle." He has patiently outlasted most of the police, the media, and even the eager regulation writers, who originally attempted to remove Thomas. 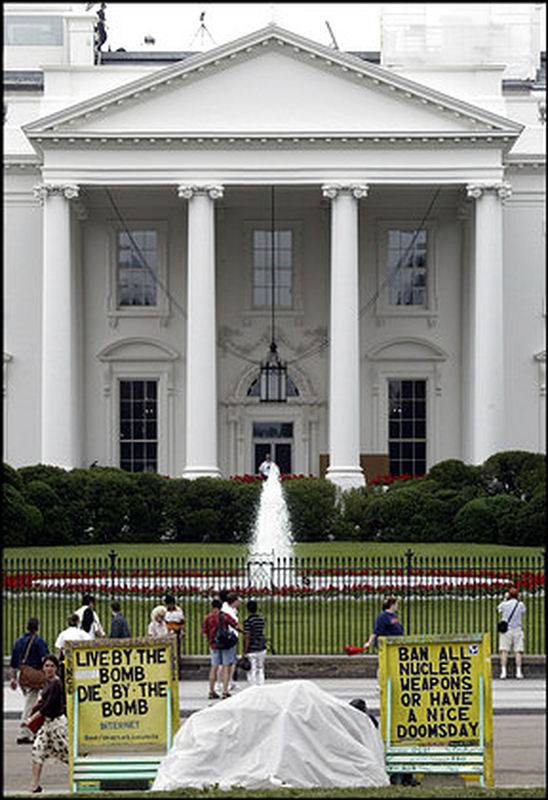 Unlike 1981, it appears for now that the White House accepts the presence of the vigil. However, that is subject to change at any moment. Meanwhile, Thomas co-founded Proposition One Committee, to promote "Reason and Sanity and an End to War in illustration of the ideals of non-violence." The greatest success so far, besides the continuing vigil outside the White House, is legislation which has been introduced multiple times into Congress since its win at the ballot in September, 1993: >the "Nuclear Disarmament and Economic Conversion Act." Most importantly, the concepts of Proposition One - global nuclear disarmament, convert the war machines - are universally appreciated by colleagues and visitors from around the planet. 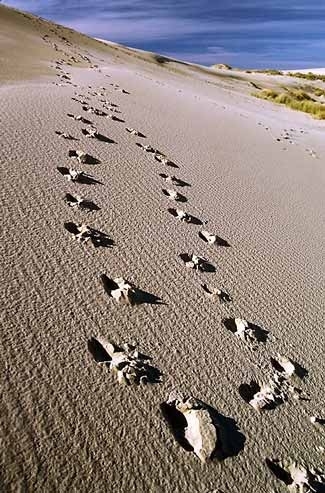 Life, Liberty, and the Hot Pursuit, ..
...Often interpretations of certain biblical writers seemed to complicate the simple truth of Jesus' words. 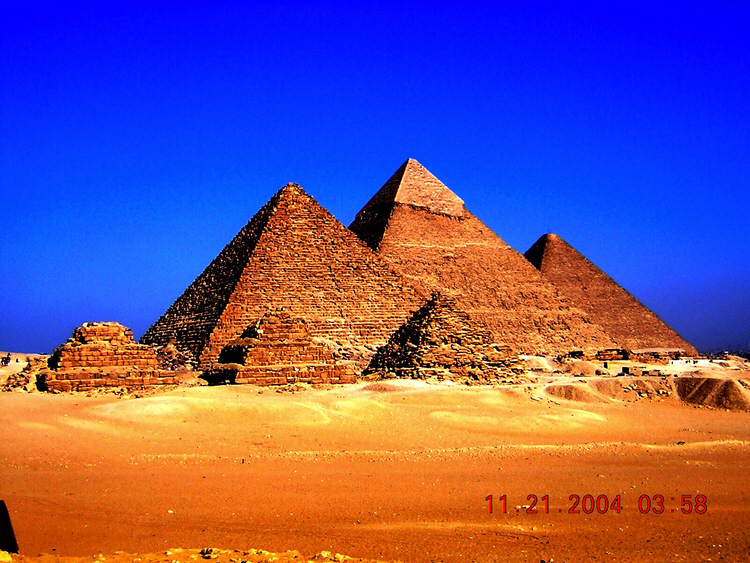 Paul wrote, "The love of money is the root of evil." ... 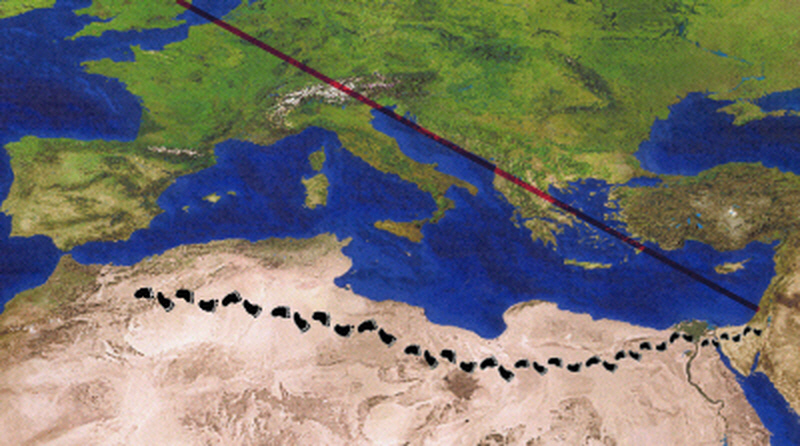 If Paul was correct, Hellanback concluded, the hatred of money would be the root of much good. He was forced to reassess the delivery process of his daily bread. If money WAS the root of, if not all, at least a great deal of evil, and people needed money to live, it seemed evil must be necessary to live, and Jesus must be talking nonsense in opposition to the truth of the world monetary system. ..
And what about fear? It began to seem that every night the TV brought new tales of murder and mayhem. On the international scene there were regular stories painting Arabs as a cruel, bloodthirsty, inhuman tribe of terrorists. On all fronts "security" was constantly being "beefed up." 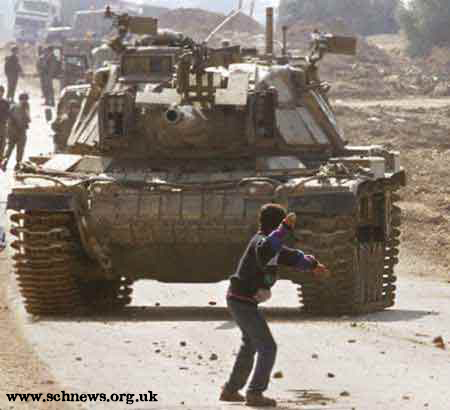 On all fronts the violence escalated. Was the answer: "Love your enemy" because "If you don't love your neighbor, whom you have seen, you can not love God, whom you have not seen?" Or was it: "Enhanced Firepower" because "In God we trust; all others pay cash"? Hellanback was taken to a military camp, searched, and questioned. After eight hours he was driven by jeep through the Gaza Strip, guarded by four Palestinian policemen. "All desert before the Israelis arrived," the ranking policeman gestured like a tour guide at the orchards as they passed. 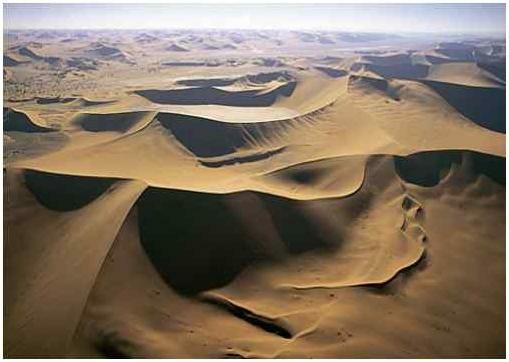 "They have made the deserts bloom." 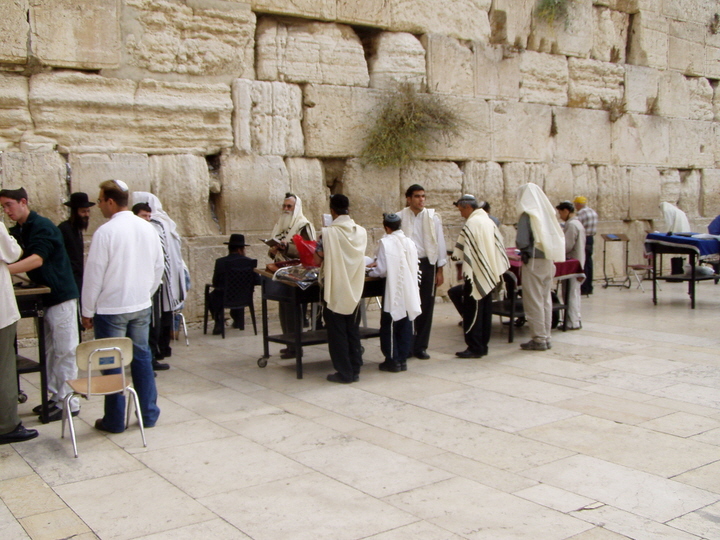 "What did you do before the Israelis came?" Hellanback asked. "I was a policeman," answered the man. Nothing's changed but the signature on his paycheck, Hellanback thought to himself. ...Governments hadn't impressed him as being motivated by reason. He had little idea what his journey held in store, maybe a lifetime in prison. But that would be a communist, Turkish, Syrian, or Israeli prison. He expected no difficulties in the "free world," where a person doesn't need papers to prove his existence is valid. Thomas was standing on a corner in Dover looking at the white cliffs and the port when the bobby approached. "Good afternoon, sir. May I see your identification papers please?" the constable asked. His nametag read "Timms." "I don't have any papers," Thomas said. "No, no. Identification papers," the policeman insisted. "You know, passport ... passaporte." "Yes, I understand. I don't have any papers." "No, no, you don't understand. Papers. Everyone must have papers." "So we can tell who you are." "That's no problem. I can tell you who I am. My name is William Thomas, a stateless person with no political or religious beliefs which would threaten anyone's person or property." "I'll have to take you to the station." "No you won't," Thomas said. The bobby took a quick step backward, startled. "I give you my permission to search me and to search my sleeping bag. If, after having done so, you have no reason to suspect that I threaten the security of any person or property then you can and should let me go." The constable saw things differently. At the station Thomas showed police officials his baptismal certificate, but they also wanted to know his place of birth and the day he entered Great Britain, information which Thomas refused to provide. The purpose of my life is to acquire wisdom and attain moral perfection. I live as a penniless wanderer and a pilgrim. Wisdom compels me to recognize that moral perfection is impossible for a member of an amoral nation-state. In the course of wandering the world I discovered the role the United States plays in destroying the Earth and exploiting its inhabitants. I learned I could not attain moral perfection while availing myself of benefits gained through the sufferings of others. So I exercised the freedom to personally determine what I would be: I ceased to be an American citizen and destroyed my American passport. 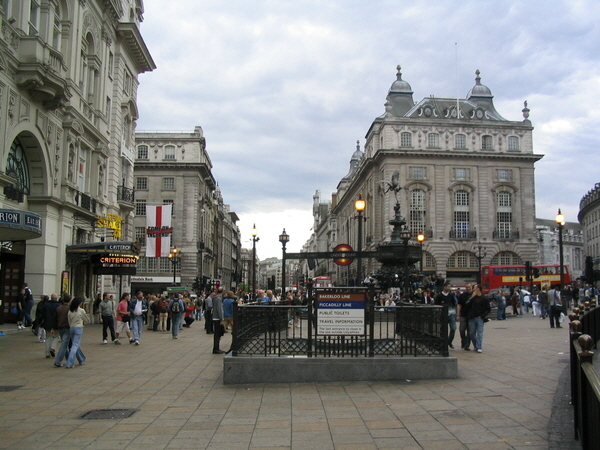 Consequently, I was "deported" from England to this country against my will and in violation of law. On October 2, 1980 I was forcefully removed from an airplane at the JFK International Airport and compelled to enter the United States despite my vigorous objection. 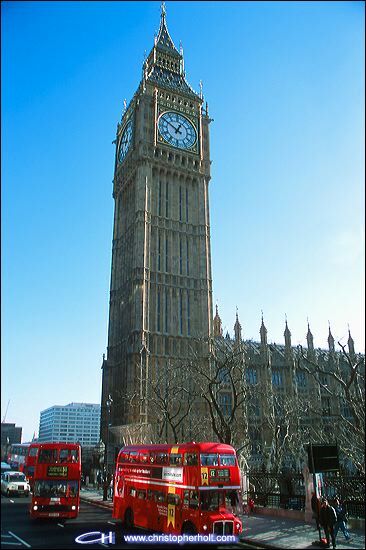 I now demand that the United States government return me to Great Britain so I can resume my pilgrimage. I intend to fast until the American government recognizes the ideals from which it draws its authority and allows me to live my life as I see fit. This is not an act of self destruction but an effort to persuade this nation to return to the principles of the Declaration of Independence upon which it was founded. Given the option of living my life in decadent luxury at the expense of my fellow creatures, or voluntarily laying it down in the service of Truth, Justice and Freedom, I would choose the latter. I entreat those who understand my words to confront the evils of the nation-state by gathering at the White House to pray for Reason and Sanity and an End to War in illustration of the ideals of non-violence.